Thanks to the inversion of the conventional construction principle, where the frame supports the glazing, this system no longer requires a frame: it simply has a surrounding profile. This unique solution offers an opportunity for architects and designers to create expansive, uninterrupted views, maximising the connection between interior spaces and their surrounds. Tracks and frames are hidden within the architecture, enabling the slimmest frames to support the largest panes of glass. 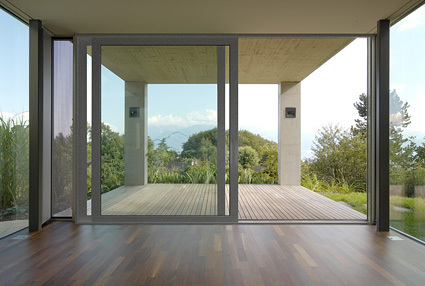 Comparison between the elegance of a Vitrocsa minimal profile window system and a conventional sliding door.